Ornithologists in Pakistan fear that populations of birds whose migration route takes them over Afghanistan may have been devastated by the weeks of bombing there. On the shores of Rawal Lake, a key conservation area only about 10 minutes drive from the centre of Islamabad, there is a sound that cannot be heard this year - a whole bird population which has suddenly gone missing. Dr Masoud Anwar, a bio-diversity specialist who monitors wildlife here, usually he sees several thousand ducks and other wildfowl migrating here from Central Asia via Afghanistan. So far this year, not one has arrived. It is a conservation disaster. "We are trying to conserve bio-diversity here, and we need the bird for that. If there's no birds, we cannot go for the conservation," he says. The same reports are coming from all over Pakistan: tens of thousands of ducks, cranes and other birds depend on Pakistan as a winter habitat, and Afghanistan is a key migration route. For the birds, the timing of the bombing could not have been worse. Oumed Haneed, an ornithologist with Pakistan's National Council for Conservation of Wildlife, says it is unclear why the birds have not appeared. "One impact may be directly the killing of birds through bombing, poisoning of the wetlands or the sites which these birds are using. 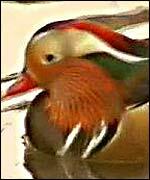 "Another impact may be these birds are derouted, because their migration is very precise. They migrate in a corridor and if they are disturbed through bombing, they might change their route," he says. Cranes are perhaps the most at risk. Three species of crane winter in Pakistan - all of them are rare. 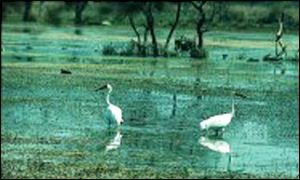 One, the Siberian Crane, is globally endangered. Asheik Ahmed Khan of the Worldwide Fund for Nature says the signs so far are very disturbing. "Previously the hunters, they used to see cranes in a group of 50 or 55. This year, they could not see them in a group of more than three. The group has become very small, and it means something is happening, somewhere." Down at the lake, monitoring teams are waiting in the hope of late arrivals. The real impact on migrating birds will not be known until surveys are completed. But ornithologists fear the bombing in Afghanistan could have devastated bird populations, some of which will struggle to recover.